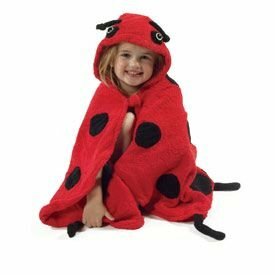 After a bath can be so much fun with this Kidorable Ladybug Towel. It is a lovely way to wrap your kid in warmth and comfort as they dry off. The 100% cotton towel is super soft for cozy comfort and absorbent to get the job done. Great for kids who like to wear costumes and play "let's pretend." Choose your child's size -- from infant to three, or from three to six. This little ladybug makes a great baby shower gift or birthday gift for an older child. This hooded-style towel is also available in a frog style with adorable little frog feet.. For more information or to order, click here.